So let me just say up front: I’ve never read this book until today. I haven’t seen the movie. The little I knew about this book was “two children travel to a magical land and then something happens to one of them.” But my husband loved this book when he was young and kept pushing me to read it. I just did, and – it was not at all what I was expecting. I find it a little funny to say “it reminds me of Looking for Alaska,” when Looking for Alaska was written much later than Bridge to Terabithia. But I read LfA first. They do have some striking similarities. Boy meets Girl, Girl affects Boy’s life in a profound way, Boy loses Girl unexpectedly and has to deal with both losing her, and the changes she wrought in his life that can’t be undone. In Looking for Alaska, Miles went looking for his Great Perhaps and thought he’d found it in Alaska. In Bridge to Terabithia, Jess wasn’t looking until Leslie pushed herself into his world and brought that Great Perhaps with her. Paterson paints a bleak picture of Jess’s life in the backwoods of somewhere-near-Washington DC. Surrounded by three sisters and his mother, while his father is gone all day working in DC, Jess appears neglected, stifled, and lonely. His family is very poor, but so are most of their neighbors. When Leslie and her parents move to the farm next door, tired of the big city and looking for a simpler life, Leslie brings Jess a window to the bigger world. Her parents tell him of things going on in far off places. And she takes him back into the dark woods behind their houses where they create an imaginary world called Terabithia. They reign as King and Queen of Terabithia, playing a game of pretend that starts as soon as they swing over the creek on a rope into a land that is solely theirs. One thing that really stood out to me was Jess’s trip to the Smithsonian with his music teacher. Maybe it’s because I’m jaded, maybe it’s because the book was written in the 70s and it wasn’t considered a big thing, but – his young, pretty music teacher takes him, JUST him, to the Smithsonian museums. He’s 10, and has a bit of a crush on her as 10-year-olds are wont to do, so he’s constantly talking about her hair, her voice, the scent of her perfume – the whole scene was just creepy to me. A young female teacher taking a young boy on a solo trip? My husband said he didn’t notice anything wrong with the scene, but he was in 4th grade when he read the book! Nothing untoward actually happens between Jess and his music teacher, but the scene still just creeped me out. Overall I can’t say I really have strong feelings about this book one way or another; it had a strong impact on my husband, but he read it when he was in the fourth grade. His comment was “the whole book is about being a child, and doing childish things, but not wanting adults to TREAT you like a child,” which does sound like something he dealt with, being an only child. Reading it as an adult just doesn’t have the same impact. All summer, Jess pushed himself to be the fastest boy in the fifth grade, and when the year’s first school-yard race was run, he was going to win. But his victory was stolen by a newcomer, by a girl, one who didn’t even know enough to stay on the girls’ side of the playground. Then, unexpectedly, Jess finds himself sticking up for Leslie, for the girl who breaks rules and wins races. 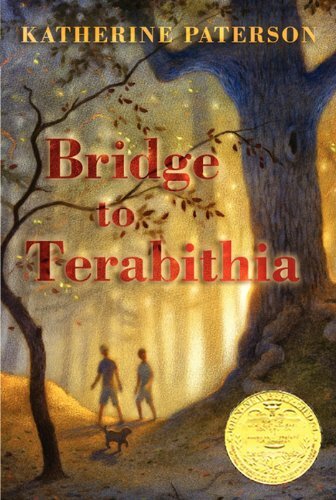 The friendship between the two grows as Jess guides the city girl through the pitfalls of life in their small, rural town, and Leslie draws him into the world of imagination – a world of magic and ceremony called Terabithia. Here, Leslie and Jess rule supreme among the oaks and evergreens, safe from the bullies and ridicule of the mundane world. Safe until an unforeseen tragedy forces Jess to reign in Terabithia alone, and both worlds are forever changed. This entry was posted in Reviews - Fiction and tagged Book Review, Bridge to Terabithia, Fiction, John Green, Young Adult. Bookmark the permalink.